Every year it seems like there are more reports of areas experiencing major flooding. If you want to protect your house from the damages that flooding can cause, one option might be to elevate or lift your home. 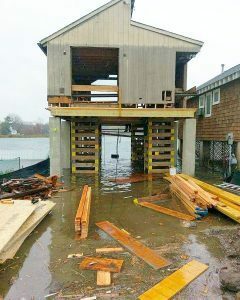 Most people have probably seen homes like this near the ocean or a lake, but you do not have to live right on the water to benefit from lifting your home’s foundation. This type of project is relatively straightforward for a company that specializes in lifting homes, even if it seems daunting to a homeowner. The easiest way to install an elevated foundation is to do it before the rest of the home is built. Often though, patterns of flooding change over time, so a house that stayed dry on the ground before may have recently begun having issues with water coming in during heavy storms. In this case, a home that is already built at ground level may need to be raised up. There are several ways of lifting homes, but one is going under the support beams of your house and drilling trenches where helical anchors are then placed. A pressure system is also installed which helps regulate the load taken by each anchor. Guaranteed for the lifetime of your house, these types of anchors are especially beneficial in areas where your home may have to withstand strong winds from hurricanes. Lifting your home is a big undertaking, so you should find an experienced professional who has a lot of experience elevating homes in your area. When considering which company to choose, you can ask for references and talk to previous customers who used its services. It is also a good idea to make sure that any company you hire is licensed and carries insurance to cover any damage that might occur from unforeseen circumstances during the process of lifting your home. The process of elevating your home should not take too long once it has begun, and afterward you can rest easier knowing that your home is likely to safe and dry.